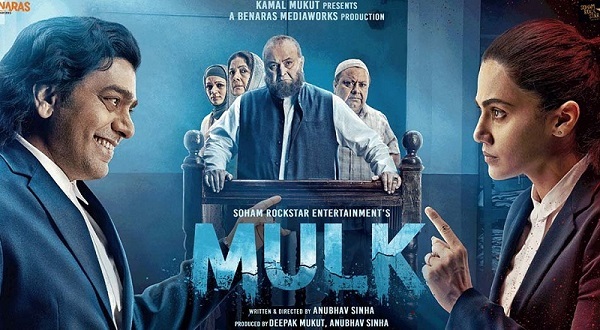 While the trailer of Mulk was a sombre one with just fleeting shots of happy moments, the ratio is sort of reversed when it comes to the music – two of the three songs in the short soundtrack are upbeat ones. The one melancholic track, Khudara, comes from Prasad Sashte, long time music producer and, I believe, debuting in Bollywood as composer. A song that, on some level, takes me back to Bhare Naina from one of director Anubhav Sinha’s past movies, Ra.One, and is rendered by Vishal Dadlani who incidentally co-composed the Ra.One track. Really well done piece though, where Sashte splendidly exploits Dadlani’s vocal skills both in terms of scale and nuances. Composer delivers equally well in his other song, the playful celebratory song Thenge Se where he and lyricist Shakeel Azmi (who writes all three songs) cleverly incorporate references to O P Nayyar-S H Bihari’s Kajra Mohabbat Wala. While Sunidhi Chauhan and Swanand Kirkire handle the song in the perfect spirit with Suvarna Tiwari’s backing, Sashte’s arrangement sees lovely use of Amit Padhye’s harmonium and Tapas Roy’s mandolin. The last song comes from Anurag Saikia, featuring in a third multi-composer soundtrack this year (it is nice to see that in three soundtracks, the man has managed to handle enough variety that he could form a stand-alone soundtrack just with his songs! ), and here it is a qawwali titled Piya Samaye. The arrangement is understandably standard here for most part. But the composer has a pretty engaging – if mildly familiar – melody as well in place, and gets a competent set of singers to deliver it with finesse – Shafqat Amanat Ali (whom I really miss in Hindi these days – the last time I remember hearing him is in Firangi last year), Arshad Hussain and his team. Given that it comes from a bunch of low profile names, Mulk’s soundtrack definitely exceeds expectations. And I really hope Anurag Saikia gets his own soundtrack at some point soon.